Sponges are primitive multicellular animals that live in water. All adult sponges are sessile (fixed to one spot), most being attached to hard surfaces such as rocks, corals, or shells. More than 4,500 living species are known. Although some species occur in freshwater, the vast majority are marine, living mainly in shallow tropical waters. Sponges have an amazing power of regeneration: they are capable of growing into a new individual from even the tiniest fragment of the original body. Sponges vary widely in shape and composition. Some are tall, extending far into the water. Others are low and spread out over a surface. Some have branchlike forms while others appear like intricately formed latticework. Many others are goblet shaped. Despite their differing appearances, all sponges have a definite skeleton that provides a framework that supports the animal. In some species, this skeleton is made up of a complex arrangement of spicules, which are spiny strengthening rods with a crystalline appearance. The soft spongy material that makes up the skeleton of many species of sponges is known as spongin. The fibrous meshwork of this material makes it ideal for holding water. Most sponges consist of an outer wall dotted with many pores or openings of different sizes. These allow the free passage of water into the central part of the body, the atrium or spongocoel (pronounced SPUN-joe-seel). Although water enters the body through a large number of openings, it always leaves through a single opening, the osculum, at the top of the body. Sponges rely on large volumes of water passing through their bodies every day, since all sponges feed by filtering tiny plankton from the water. This same water also provides the animals with a continuous supply of oxygen and removes all body wastes as it leaves the sponge. 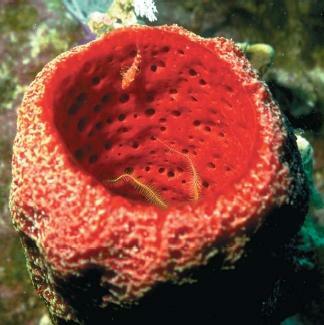 Sponges reproduce either sexually or asexually. In sexual reproduction, a male sponge releases a large amount of sperm cells in a dense cloud. As these cells are transported by the water currents, some enter female sponges of the same species. They are then transported to special egg chambers where fertilization may take place. Once developed, a freeswimming larva emerges and is carried away by the currents until it finds a suitable surface on which to attach. In asexual reproduction, new offspring are produced through the process known as branching or budding off. A parent sponge produces a large number of tiny cells called gemmules, each of which is capable of developing into a new sponge. A simple sponge, for example, sprouts horizontal branches that spread out over nearby rocks and give rise to a large colony of upright, vase-shaped sponges. Humans have used sponges for bathing, drinking, and scrubbing since ancient times. Most sponges of this sort originate in the Mediterranean and Caribbean Seas and off the coast of Florida. Although synthetic (human-made) sponges are now commonly sold, sponge fishing is still a major industry in many countries.